China Then and Now, an exhibition opening at the Nassau County Museum of Art, Long Island, brings together exemplary Chinese works of art from the classical, early modern and contemporary periods. The exhibition explores three millennia of one of the world’s most important artistic traditions from the perspective of American collectors on Long Island, such as Childs and Frances Frick and Dr. Arthur M. Sackler. The exhibition opens on November 22, 2014 and remains on view through March 8, 2015. It is the museum’s first exhibition devoted to Asian art, China Then and Now sheds new light on a fascinating chapter in America’s engagement with China and its arts. This exhibition reveals the passion of American collectors of both the past and present for the culture and history of China. China Then and Now unfolds over three galleries, each of which showcases the elegant beauty of Chinese art of different eras and media. The exhibition opens with 11 large-scale classical stone sculptures lent by the Art Properties, Avery Architectural and Fine Arts Library, Columbia University and formerly in the collections of Arthur M. Sackler. At the heart of China Then and Now is an installation of blue-and-white porcelains from the Ming and Qing eras (17th to 18th centuries) collected by Childs and Frances Frick and on loan, for the first time, from The Frick Collection in New York City. This display reunites these works with their original setting, the Georgian-style Bryce-Frick mansion that is today the home of the Nassau County Museum of Art. 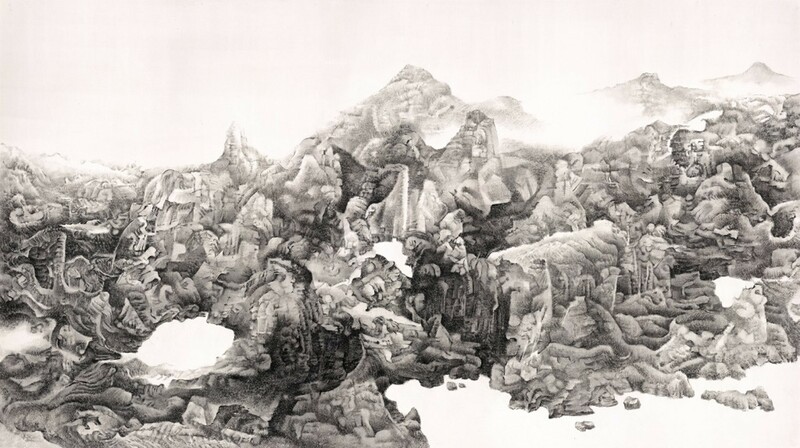 A final gallery presents extraordinary ink paintings by the renowned Beijing artist Liu Dan (born 1953) whose works bridge traditional forms with contemporary practices. Among the special events in conjunction with the exhibition, on Saturday, December 20 at 3 p.m. Daisy Yiyou Wang, Curator of Chinese and East Asian Art at the Peabody Essex Museum, will give a lecture A Thousand Graces: Chinese Buddhist Sculpture in America Then and Now. The talk traces the journeys of Chinese Buddhist sculptures from early 20th-century temples to their display in American art museums as they fascinated noted American collectors such as Dr. Arthur M. Sackler, Charles L. Freer and John D. Rockefeller, Jr. Wang shares her new research on Charles L. Freer, the founder of the Smithsonian’s Freer Gallery of Art, exploring his collection of Chinese Buddhist art. She is the author of a forthcoming monograph on Freer and his collection. Admission is $15 (museum members, $5) and includes museum admission. Register at nassaumuseum.org/events. Sponsored by HSBC Private Bank, China Then and Now is co-organized by guest curators Amy G. Poster, Curator Emerita of Asian Art at the Brooklyn Museum, and Kaijun Chen, Ph.D., post-doctoral Fellow at the Max-Planck-Institute for the History of Science. Docent-led tours of the exhibition are offered at 2 p.m. each day; tours of the mansion are offered each Saturday at 1 p.m.; meet in the lobby, no reservations needed. Tours are free with museum admission. Family art activities and family tours are offered Sundays from 1 pm; free with museum admission. Nassau County Museum of Art is located at One Museum Drive in Roslyn Harbor, just off Northern Boulevard, Route 25A, two traffic lights west of Glen Cove Road. The museum is open Tuesday-Sunday, 11 a.m.-4:45 p.m. Call (516) 484-9338, ext. 12 to inquire about group tours. Admission is $10 for adults, $8 for seniors (62 and above) and $4 for students and children (4 to12). Members are admitted free. The Museum Store is open Tuesday through Sunday, 11 a.m. to 4:30 p.m. Call 516-484-9337 for current exhibitions, events, days/times and directions or log onto nassaumuseum.org. This entry was posted on November 19, 2014 at 6:08 pm and is filed under Long Island, museums. You can follow any responses to this entry through the RSS 2.0 feed. You can leave a response, or trackback from your own site.